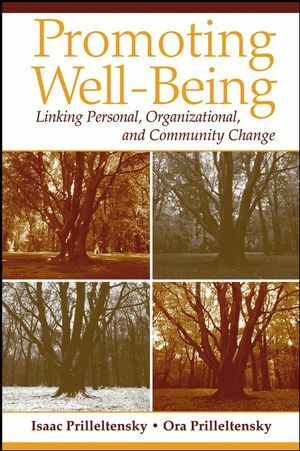 The only book that links psychological wellness with organizational and community health, Promoting Well-Being provides you with important insight into how these domains interact as well as strategies for helping clients harness the benefits of these interactions. It is an essential tool for psychologists, counselors, social workers, human service professionals, public health professionals, and students in these fields. ISAAC PRILLELTENSKY, PhD, is Dean, School of Education at University of Miami, Florida. ORA PRILLELTENSKY, EdD, is Lecturer, Department of Educational Psychological Studies at University of Miami, Florida. She has worked in a number of applied settings, including schools, counseling services, and rehabilitation programs. 1. Webs of Wellness: The Sites of Well-Being. 2. Webs of Growth: the SPEC of Well-Being. 3. Webs of Values: The Morals of Well-Being. 4. Webs of Strategies: The Practice of Well-Being. 5. What is It? Signs of Personal Well_being. 6. Where Does It Come From? Sources of Personal Well-Being. 7. How to Promote It? Strategies for Personal Well-Being. 8. What Is It? Signs of Organizational Well-Being. 9. Where Does It Come From? Sources of Organizational Well-Being. 10. How to Promote It? Strategies for Organizational Well-Being. 11. What Is It? Signs of Community Well-Being. 12. Where Does It Come From? Sources of Community Well-Being. 13. How to Promote It? Strategies for Community Well-Being. PART V: CHALLENGS AND CONCLUSIONS. 16. Arrogance, Complacency, and Blinders.